Still virtually unknown, JOHN HENRY HAYNES (1849–1910) is the father of American archaeological photography. His travels took him from Athens to Istanbul and on to Mesopotamia. In this landmark study, now revised with additional unpublished photographs, Robert G. Ousterhout assesses his unique blend of artistry and documentation. John Henry Haynes is described as ‘The father of American archaeological photography’ (writes Roger Williams), and if Haynes is not as well known as he should be, John Henry Haynes: A Photographer and Archaeologist in the Ottoman Empire 1881–1900 by Robert G. Ousterhout explains why. In some ways this farm boy from Massachusetts, born in 1849, didn’t have much chance against fellow archaeologists engaged in trampling over each other to further their names. True, Haynes lacked a solid Classical education, and some of his colleagues considered him common and slow-witted, but he had an artistic eye, photographed places unknown and had one particularly spectacular find. He was even appointed the first American Ambassador to Baghdad. This is a revised edition of a book that came out in 2011, refreshed with some unpublished pictures as a companion to a new and timely title, Palmyra 1885. Ousterhout is the author of both books, co-authoring Palmyra 1885 with Benjamin Anderson. They are published by Cornucopia and presented with the visual elegance readers have come to expect from the magazine. Many of the images in the reissued book, described as a ‘landmark study’, come from the archives of Harvard University and from the University of Pennsylvania, which was involved in some of these early expeditions and where Ousterhout is Professor of Byzantine Art and Architecture. Haynes’ mentor was the charismatic William Stillman. A protégé of John Ruskin’s, Stillman was known as The American Pre-Raphaelite, and in a chapter on the photographer as artist, Ousetrhout explains in accessible language the complexities and the creativity of Stillman’s and Haynes’ images. Stillman had successfully published a book of photographs of Athens as well as The Amateur’s Photographic Guide Book by the time he and Haynes met in 1881, the year after the American Institute of Archaeology had been formed. Their AIA-funded expedition to Crete, pre-Arthur Evans, had been thwarted, and they found themselves in Athens where Stillman attempted to re-create the striking photographs of his original book, some of which are reproduced here. In Athens Haynes assisted and learned his craft, which would first be put to the test at Assos, 35 miles south of Troy and AIA’s first Ottoman expedition. It is immediately evident that Haynes had his own style. Whereas Stillman’s pictures make dramatic use of structures and angles, Haynes’ pictures include men and boys working with him, not just to give a sense of scale but to help share the human experience. “Today we see the early excavations at Assos primarily through the eyes of Haynes,” Ousterhout writes. The book divides Haynes’ career as an archaeological photographer into three stages. The first is ‘a foothold in the east’, when he is travelling around Anatolia and, between seasons, teaching at Robert College in Istanbul. In the second, he is based at The Central Turkey College at Gazientep (1885–87), visiting Cappadocia, travelling with William R. Ware, founder of the School of Architecture at Columbia University, and joining the Wolfe Expedition to Syria and Mesopotamia. The third is with the volatile Babylonian Exploration Fund to find sites that might support the veracity of the Bible. 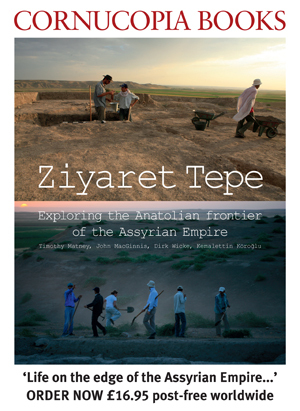 Frustratingly for American archaeologists and their sponsors, these expeditions arrived on the scene a little too late, because by 1884 an Ottoman law had been passed preventing the removal of archaeological finds from anywhere in the empire. But Haynes was the first to photograph a number of sites, such as the Hittite monument at Eflatunpınar. He also captured places that have utterly changed: as Stillman was to Athens, so Haynes was to Ankara, a small deserted village with a lonely Byzantine fortress. Sultan Han, Anatolia’s largest caravanserai, looks wild and wonderful compared to its modern, rebuilt incarnation, while the beehive houses of Şanlıurfa seem from another planet. Haynes’ sense of wonder of Cappadocia, captured in more than 300 photographs, was not shared with his fellow Americans until nine years after his death in obscurity, “broken in body and spirit”, in 1910, when 52 of them were published in National Geographic with text by Sterrett – who took credit for the pictures, too. And it was Hermann Vollrath Hilprecht, Professor of Assyriology at Pennsylvania University, who took the credit for the discovery of 23,000 tablets thought to be from the Temple Library at the Sumerian city of Nippur, though it was Haynes who found this extraordinary treasure trove. Hilprecht and the Babylonian Exploration Fund’s team leader, John Punnett Peters, had clashed, and walked off the project leaving Haynes, an inexperienced team leader, to continue the excavations. Not only was he not thanked for his finds, but Hilbrcht took the laurels, using some of Haynes’ pictures without acknowledgement in his subsequent book, Explorations in the Bible Lands in the 19th century. Architecture defines civilisations, and many of the sites that Haynes photographed give a sense of the crumbling nature of man as his buildings are corroded by time, and of landscapes oblivious to his efforts. It also shows the importance of photographs as instruments of record. This is certainly true of Palmyra, which Haynes photographed at the behest of the AIA on the Wolfe Expedition. These pictures are now compiled in Palmyra 1885, the companion book, and confirm Haynes as the Father of American Archaeological Photography. Roger Williams is a contributor to Cornucopia.net and author of The Fisherman of Halicarnassus and a number of travel books. Two books from Cornucopia on the photography of John Henry Haynes, unsung hero of American archaeology.